Brighton & Hove Albion striker Aaron Connolly is looking forward to being part of a promotion challenge after taking part in his first Luton Town training session at The Brache this morning. 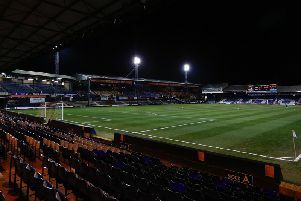 The 19-year-old agreed to join the Hatters until the end of the season on January transfer window deadline day, while he was recovering from a hamstring injury picked up in an U23 fixture against Liverpool. It kept him out for just under three months, but Connolly is now fully fit once more and wants a second promotion on his CV after going up to the Premier League Two Division One with the Seagulls last season. Connolly said: "It’s a dream scenario to come into a promotion chasing squad, and hopefully play any part I can to hopefully keep that push going. "Mick (Harford) has said just to help as much as I can and see what happens in the next month or so. "We are first in the table, and probably got a good chance of winning it having got promoted last year from Division Two, so hopefully I can have another good experience like that here – especially in front of fans, which will make it even better." The young attacker was back in action for Brighton on Friday night, as he notched an 18th goal of the season during a friendly win over Canadian outfit Vancouver Whitecaps. On his return he said: "It’s been two or three months since I did my hamstring, so I had to get that right down at Brighton and get some minutes under my belt. “I managed to get a goal, which is always nice, but that game was just about getting fitness back to be ready to come up here. "It’s all about getting back on track and hopefully scoring goals again, so hopefully I can do that here and keep that promotion push going. "It was good getting the deal done back in January, but obviously I couldn’t join until I got back from injury, which was very frustrating, but it’s good to be here and I’m ready to go." One of Connolly’s strikes this term came against Luton in the Checkatrade Trophy group stage game at Kenilworth Road in early September, while he was named PL2 player of the month for both November and December before injury struck. There were a few familiar faces to welcome him to Hatters today, as he added: "I know a few of the Irish boys here having met them when we played at Kenilworth Road in the Checkatrade, like Alan Sheehan and Alan McCormack.